I waited too long to back up my laptop. In fact, I waited close to eight weeks, which is about seven weeks too long. Somehow, the difficulty involved in backing up each document that I’d updated that week month was far more than my brain could handle. Besides, my current back-up drive was already fairly maxed out on space. It’s not like I could just back up “My Documents;” I had to be selective, which was tedious and time-consuming. So, what happened next is quite predictable. Actually, I was in the process of turning on my laptop and plugging in my back-up drive to do what I’d procrastinated for so long. And then, I got the blue screen of death. I never want to have to write another post like that, again. It was dreadful not knowing whether I could recover photos of my son. It’s true that it takes a data loss in order for you to get paranoid about backing things up and avoiding that costly mistake again in the future. I was able to get my data recovered from my hard drive that had somehow become unseated within a certain corrupted sector–whatever that means. It was expensive. PAINfully expensive. But, I needed photos of my sweet son, those marketing brochures I had created from scratch, and 6 weeks worth of electronic patient files that I did not want to re-create. Ugh. Funny thing is, once the data recovery company retrieved the data, they sent it to me on a Seagate hard drive. My retrieved data arrived the week after I received a Seagate Replica for review. It took 2 minutes to install and register the Replica’s software so that it was ready-to-use. If you can avoid using your computer during the initial back-up, it may take only 3 hours. This complete back-up system backs up everythang, including the operating system, programs, and settings. Oh. YEAH. The Replica automatically removes the oldest backed-up versions of files to free up space for newer versions. How clever! The single greatest benefit of the Replica is that you can leave it plugged into your PC, and it will automatically back-up any newly updated files. 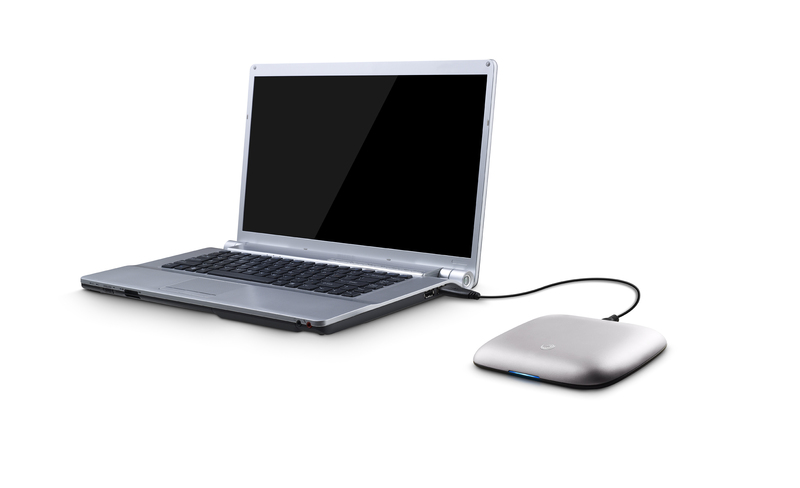 It’s got a great memory, so you don’t need to worry about forgetting what to back-up. Ta-da! Back-ups are completed automatically. How’s that for effortless and extremely valuable? If you take your laptop with you to the local java house to hammer out a post or a chapter of that book that you’re writing, never fear. Just plug in the Replica when you get home, and it’ll back up everything in a jiffy. It’s slim and petite. 5 1/2″ wide, 4″ deep, and 3/4″ tall, it doesn’t take up much room. It weighs just over a half-pound. Weighing in at 250 GB, I won’t be running out of room anytime soon. I can keep photos, videos, and tons of other files on there for years to come. Now, I wish I had one of these 4 months ago. That would have been great. *The multi-PC version of the Replica ($179.99) has 500 GB of storage space, and a storage dock. Do you know of a blogger, parent who loves to store digital photos of her children, or someone who’s particularly engrossed on working on a PC? The Seagate Replica ($129.99) would make a great gift. You could help someone prevent a considerably expensive and mournful data loss with a simple and easy solution. Note: The Replica requires Microsoft® Windows® XP (Service pack 2 or higher) OR Windows Vista®. One winner will receive a Seagate Replica for Single PC , (retail value $129.99). Stay in-the-know and become a Seagate Fan on Facebook or follow them on Twitter. To enter, leave a comment relevant to this post prior to Saturday, November 28th at 11:59 p.m. Please follow the contest rules and avoid any generalized comments, or you will be disqualified. Two Seagate Single-PC Replicas were provided for the purpose of this review, one for me to use, and one for me to give away. 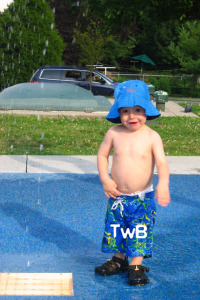 Read Traveling with Baby’s complete disclosure policy. UPDATE: Congratulations to the winner, #19 Mike. Made to Stick: Why Some Ideas Survive and Others Die is a must-read for teachers, writers, entrepreneurs, leaders (both military and civilian), public speakers, and anyone who’s interested in getting a point across effectively and memorably (parents, take note!). It launches from “sticky” concepts first presented in Malcom Gladwell’s phenomenal book Blink about rapid cognition and first impressions and decisions in Blink . Not only are the key points about developing “sticky” ideas presented with concrete examples, witty humor, and well-researched points–but there are clinics. Ya know, application-style workshops embedded within the book. You’ll apply the concept you were just taught in a simple, but effective exercise. These authors are smart cookies, since they teach the reader how to catch the rhetorical fish. Do I have to learn this? When am I ever going to use this in real life? I can think of m-a-n-y teachers, instructors, and academic professors that I had through the years who would benefit from this book. Heh. Seriously, it’s made me think more strategically and sticky about creating blog posts, teaching patients, and presenting seminars in my community. And, since we’re planning to homeschool our son, I now know better how to help my son get ahead of the learning curve in math at an early age. Oh yes! This book even gives examples on effectively teaching math to children. Do you have a writer, teacher, parent, or business owner on whom you’d love to bestow an encouraging and thoughtful gift? This is the gift. This is IT. You can purchase the Made to Stick ($26) through 800 CEO READ.com or through Amazon.com . One winner will receive a signed copy of Made To Stick, (retail value $26 ). For more sticky ideas, check out the Made To Stick blog, and sign up for free sticky resources on the Made To Stick website. Two signed copies of Made To Stick were provided for the purpose of this review and giveaway. Read Traveling with Baby’s complete disclosure policy. UPDATE: Congratulations to the winner, #3 Susan. 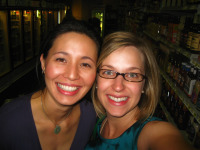 I’ve been thinking about pregnant mamas since Elisa, an author on Traveling with Baby who’s 41 weeks pregnant, is going to meet her son very soon. Showers are great opportunities to share wonderful blessings with an expectant mom and her little blessing. However, the holidays are another opportunity to give loving and useful gifts to new parents. Homemade baby leggings — you can read my tutorial on how to make your own! A stretchy100% cotton baby wrap carrier – Helps keep baby snuggly close and content while sleeping, nursing, or hanging out with mom. I loved the nursing cover that my sister-in-law created for me. I never left home without it so I could comfortably and modestly nurse in public. Juliea Paige, owner of Etsy shop Willow Moonspirit, created Gypsy Jewels and Nursing Clips. Instead of packing a diaper bag full of swaddling cloths, warm blankets, AND a nursing cover, you can lighten your load by just keeping nursing clips with you. A hand-beaded, 17-inch chain is tipped with silver alligator clips on each end. With so many color bead options available, it’s hard to choose. Fortunately, you can customize the colors you or your gift recipient likes. 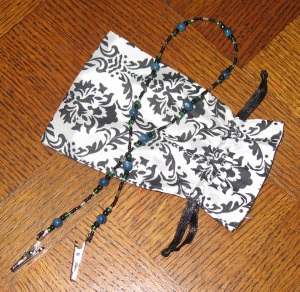 The beautiful clips are packaged in a beautiful damask-printed draw-string bag–perfect for gift-giving and storing. These days, I don’t use a nursing cover much with my toddler since breastfeeding is far less frequent during the day. However, I did try out the clips with a couple of smaller baby blankets while nursing my son. The necklace part of the chain felt comfortable around my neck with the weight of a blanket. I could easily change the positioning of the clips on the blanket, as needed. In it’s storage back, the nursing clips necklace is only a few ounces and easy to find in a diaper bag. The biggest plus about the nursing clips are that if baby spits up or milk leaks onto a blanket, you can easily throw it in the wash and have another spare blanket or sweater, and you’re ready to go without waiting for a standard nursing cover to come clean in the laundry. At $13, it’s far more economical than most nursing covers available on the market. 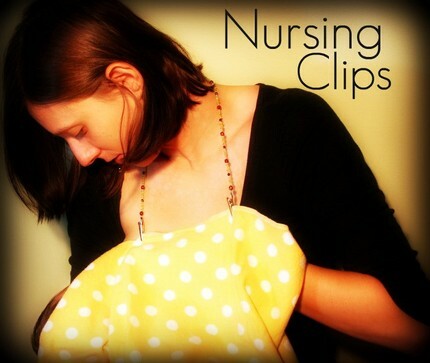 One winner will receive a nursing clips by Gypsy Jewels, (retail value $13). A gypsy jewel nursing clip was provided for the purpose of this review. Read Traveling with Baby’s complete disclosure policy. UPDATE: Congratulations to the winner, #1 Melissa Haynie. Back in January, Ethel’s gardening gloves were featured on Traveling with Baby. I’ve enjoyed wearing my Signature pair while driving. I’ve also worn them while planting of tomatoes and herbs in our backyard in the spring and summer. Just when you think a company has reached a high tier in forms of function and design in creating a great product–they suddenly surpass greatness and arrive at something even better and more eco-friendly. 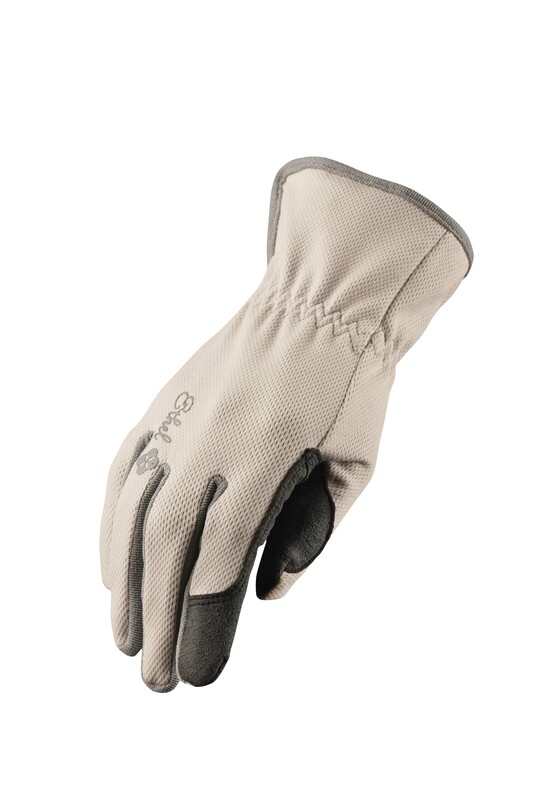 Ethel’s latest additions include two styles of gloves made from bamboo with synthetic leather (NOT suede) palms. These beauties are available in black with a caramel palm ($26) and off-white ($16) with new colors for spring and fall in the design-works. The gloves are available in small, medium, and large. Ordering from Ethel means you don’t even have to bother with gift wrap–truly, Ethel’s got packaging down to an artful science. Look at the inside of the box of gloves (the outside was equally pretty): full color photographs on the box flaps, beautiful cards next to gorgeous gloves. If you (or your gift recipient) joins the Ethel master gardener program, you’ll receive a sneak preview on any newly released products. 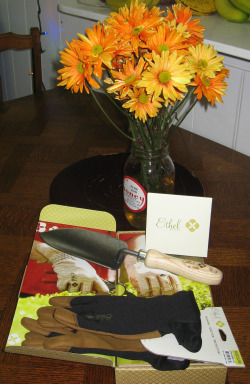 As a “thank you for reviewing,” Ethel sent me a beautiful trowel with a wood handle designed by DeWitt. Just look at how stunning this looks…I can’t wait to try it out in the spring! Ethel gloves are a wonderful gift for the green-thumb gal. Go eco-friendly by choosing the bamboo designs. But, if those aren’t your thing, check out the numerous styles of gloves for women (and kids!). 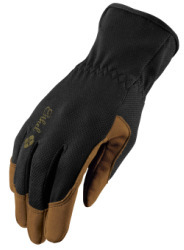 One winner will receive a pair of black Bamboo gloves by Ethel (retail value $26). For the latest news and product releases from Ethel, follow them on Twitter or become a fan on Facebook. 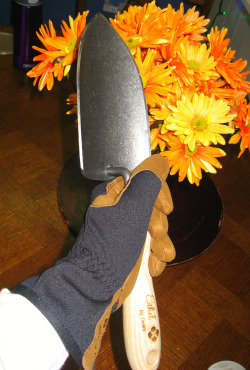 A pair of bamboo Ethel gloves and DeWitt trowel were provided for the purpose of this review and giveaway. Read Traveling with Baby’s complete disclosure policy. UPDATE: Congratulations to the winner, #20 Julie L.
I can’t think of a better gift that’s cherished year-round by grandparents other than photos of their sweet grandchildren. Last year, I created a “book of Calvin” filled with my favorite photos of my son. We printed copies for each of his grandparents and great grandparents. We’ve also purchased multiple photo frames including a collage of several specially-selected photos. 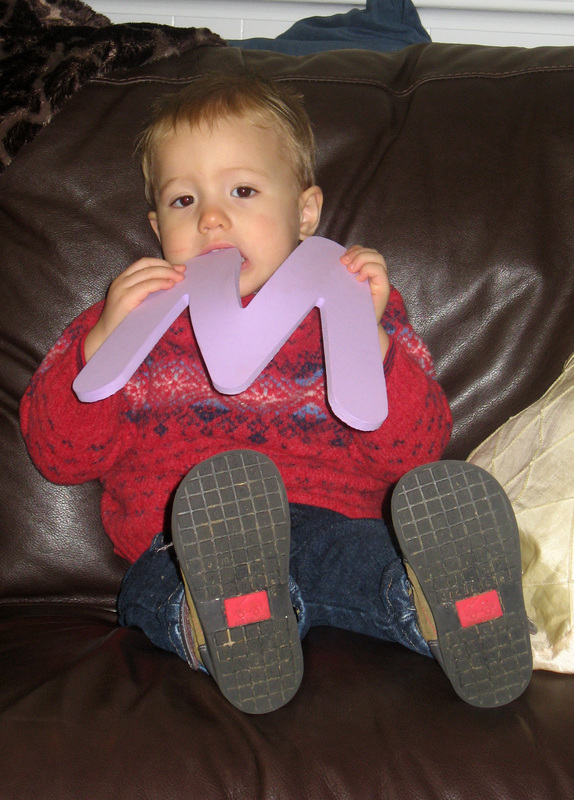 This year, for personalized Christmas cards, I took photos of Calvin posing with individual alphabetized letters. I’m going to group them together so that combined, the letters will read, Merry Christmas. I actually took all the photos for this personalized Christmas card last month. I remembered every letter except for “A”–and I’ve kinda put off another photo session since taking one photo usually becomes a bit of a struggle and lasts 30 minutes or more. Seriously, I don’t understand how children’s photographers do what they do. Gifted folks, I tell ya! Anyway, it’s tough to get grandparents anything since they almost always already have everything they could possibly need or want, except precious photos of the little ones so precious to them. Point. Shoot. Print/Develop. Frame. Wrap. If you are simply not into the photography thing, find someone who is…it’s so worth it to capture your little ones on film before they grow older by leaps and bounds a mere 5 minutes later.